Panimalar Institute of Technology, Chennai has advertised in THE HINDU newspaper for recruitment of Associate Professor, Assistant Professor jobs vacancies. Interested and eligible job aspirants are requested to apply with in 13.06.2018. Check out further more details below. 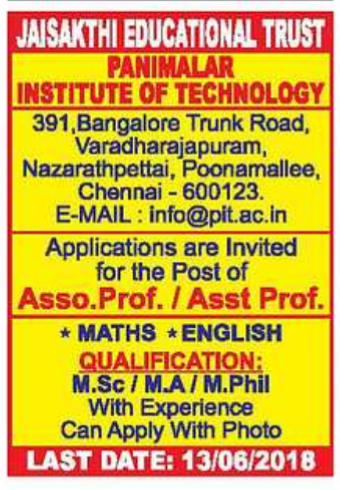 Panimalar Institute of Technology, a Christian Minority Institution of Technical Education functioning under Jaisakthi Educational Trust is intended for the dissemination of profound knowledge among the ambitious student community in Engineering and Technology. It has established its reputation in not only imparting high quality education but also in emphasizing discipline. How to apply: Interested and eligible candidates can apply with in 13.06.2018 photo.